I could barely hear Dave Megin, the CNHARC club president, over the pounding raindrops pelting my Ford Super Duty F-250 truck and the windshield wipers swishing back and forth at their highest speed. 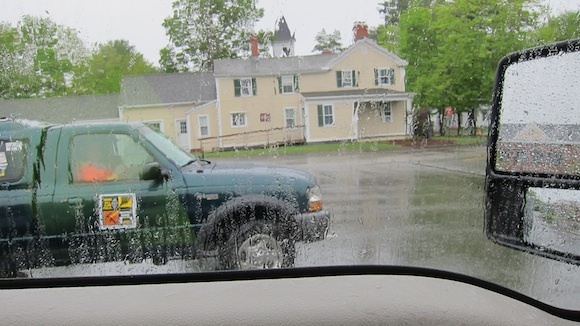 It was 6:15 a.m. Saturday May 17, 2014 and I was straining to see through the sheets of pouring rain as I was driving towards the Tradeport in Portsmouth, NH. In less than an hour courageous bicyclists would be starting to ride in this foul weather towards Ongunquit, Maine. While the cyclists could choose from three routes (25, 40 or 55 miles), those deciding to take the longest route would experience hours of torture if these conditions continued through the morning. Breathe NH is a non-profit organization that uses the annual two-day bike ride to raise money. Riders have a choice of three different courses depending upon their fitness and endurance. Most riders who participate, no matter which route they take to Ongunquit, ME, accomplish this feat in about six hours. Lunch, massages, a heated pool and giant hot tub await them at the Meadowmere Resort. The cyclists, Breathe NH staff and support crew, volunteers and us ham radio operators take over an entire wing of the spacious resort just one-half mile from the heart of Ongunquit. 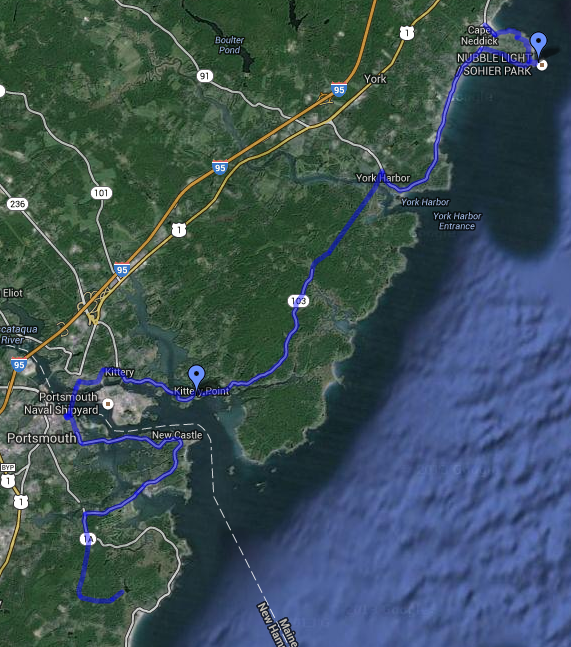 The following morning they would bike back to Portsmouth, NH on their choice of two routes, one 35 miles and the longer one 52 miles. I wandered inside the Registration area. There were far more volunteers there than bicyclists. That’s not a good thing. Up ahead I saw Dave and wandered towards him. “Who else is working the event,” I asked. That seems like a lot of ham operators but in reality it was a razor-thin crew. The cyclists get spread out during the event and we need to have ham radio operators at the front, middle and behind the last riders to make sure they all get to the finish line safely. What’s more, there were two courses that needed safety coverage by our crew. This would stretch our communication resources to the limit. It would have been much better to have at least ten 50-watt radios shadowing the cyclists, but that was not to happen on this weekend. To add to the complexity, we work this event primarily on simplex frequencies. This means it’s common for messages to be relayed to and from the ham operators who are not only mobile, but are also often 20 or 30 miles apart. 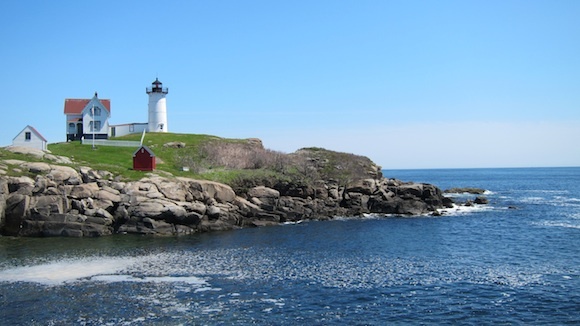 While that may be a walk in the park on the flat plains of Montana or Kansas, it can be a challenge on the hilly and rocky coastline of Maine. This was my second time working this fascinating public service event. Two years before it had been a picture-perfect warm spring day. This year, it was gloomy, rainy and depressing. The start of the race was delayed about fifteen minutes because the heavens opened up with a drenching downpour. Dave had me head out to get ahead of the pack of the serious riders. He wanted me to drive out to the first rest stop at Greenland Central School in Greenland, NH. A new feature this year were assigned navigators. Lindsay, a 25-year-old graduate student in museum curation, was to be my north star on this day. We raced to my truck trying to avoid the raindrops drilling into us, but both of us got soaked in the process. It didn’t take long to get to the school where rain was keeping the water and snack volunteer inside her van trying to stay dry. She had wisely placed cases of bottled water on the legs of the collapsible canopy keeping it from blowing away. Lindsay and I exchanged the customary “Who-I-am-and-what-I-do” conversation as we awaited the first riders and our relief, Mary – N1RKO. Ten minutes later, Mary showed up pulling alongside us in her green Ford Ranger pickup truck. Mary’s a seasoned ham operator and has worked this event for years. She loves the outdoors and volunteers to work many public service events. Once Mary arrived, Dave had me follow the lead riders as they clawed their way through the rain and wind on the circuitous route towards the coastline. Lindsay and I made it to Wallace Sands State Beach just south of Portsmouth, NH. We were on the lookout for warm coffee and a place to make a nature stop. The rain had turned to a drizzle, but it was cool, and the ocean was a steel gray. The cloud ceiling had to be less than 200 feet. We discovered a general store in Rye, NH that was open and deserted. There we made the exchange of liquids and got back in my beast heading north up the coast. The rain had stopped, for now. If you work a public service event like this, the outcome all desire is no serious problems. As it would turn out, we achieved that goal. The only injuries suffered were several flat tires over the course of both days. That’s a very good thing. Our next stop was Ft. McClary. You don’t have to be a military expert to understand why the fort was built at this location. Ships trying to approach Portsmouth harbor were staring directly into cannons that could pick off the ships like fresh steaming lobster off a plate. We stayed at Ft. McClary for about 20 minutes waiting for Mary to relieve us once more so we could leap frog up to the historic Nubble Lighthouse at York Beach, ME. When we arrived at the Nubble Lighthouse, the weather looked grim. The fog was thick and you looked out to sea into a ghostly gray sheet of nothingness. If I were on a ship moving at 20 knots in that soup, I’d for sure be working on a mild anxiety attack wondering if my radar and GPS were really working. Imagine how sailors of old must have felt without the technology we enjoy. After Nubble, we started to sprint towards the finish line. “Lindsay, look. I can see blue sky!” I was looking out my driver’s side window and sure enough there was a patch of glorious blue. Mother Nature had decided to move on and punish our allies to the northeast in the Maritime Provinces of Canada. Just after 12:30 p.m. Lindsay and I pulled into the parking lot at the expansive Meadowmere Resort on the main drag at Ogunquit, ME. I’d guess that 15 cyclists had already made it to the finish line. They were getting rehydrated and some were getting ready for the complimentary massages to work out any cramps that were lurking in their legs. 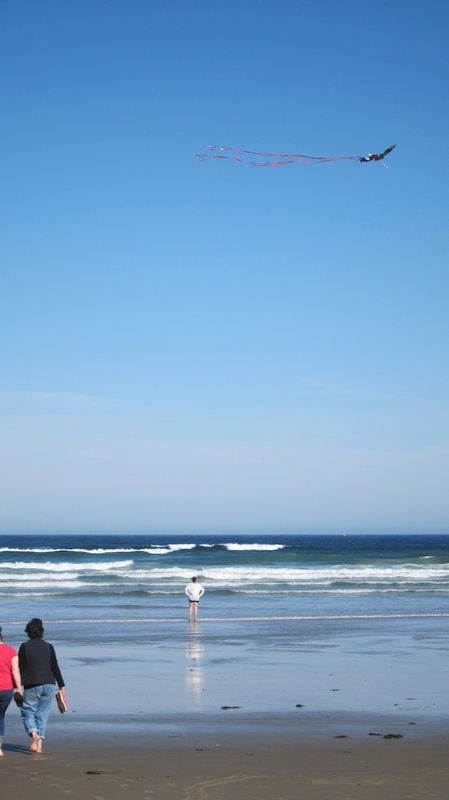 After eating lunch, Dave released me from duty and I headed down to Ogunquit Beach to do Morse code with anyone that might hear me on my low-powered HB-1B radio. By then the skies had cleared and it had turned into a gorgeous warm afternoon. This is one reason I love volunteering for this event. You get the afternoon off to enjoy the ocean before it gets clogged with the summer tourists. But realize it’s important to get back to Meadowmere by 5 p.m. to enjoy dinner with the cyclists and all others who participated. I thought dinner was at 6 p.m. and wondered where everyone was when I got back to the motel from my afternoon of invisible radio waves and conversations about my strange green kite string (halyard for my antenna) that seemed to be snagged in a tree. It was about 5:10 p.m. when I arrived and it was a ghost town in the parking lot. The next day was uneventful as I had the glorious job of working sweep on the long course headed back to Portsmouth. The advantage of sweep is that you get to creep along behind the last rider. This allows you to really see what’s on either side of the road. Typically you zoom past all the houses, horses and hayfields at 40 or 50 mph. 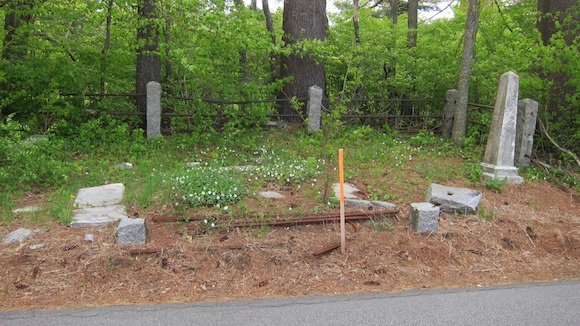 Among other things I saw a tiny cemetery right up against the road. 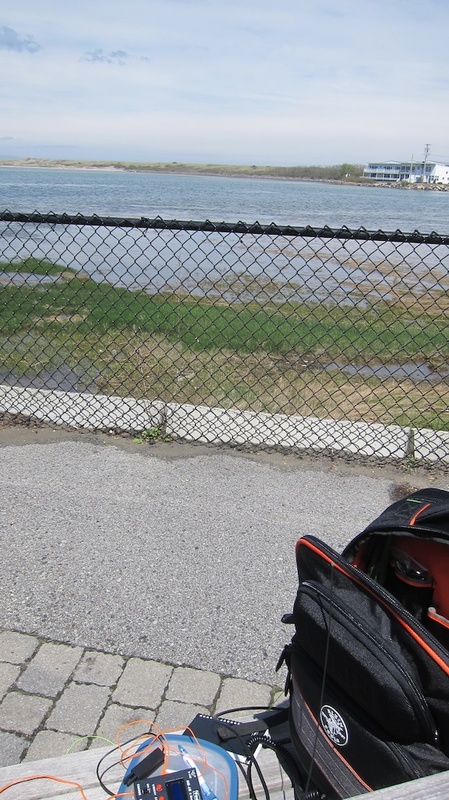 Once back in Portsmouth at the Tradeport finish line, a delicious picnic lunch with grilled hamburgers awaited us. We sat in the sun and regaled in another safe CNHARC public safety event. 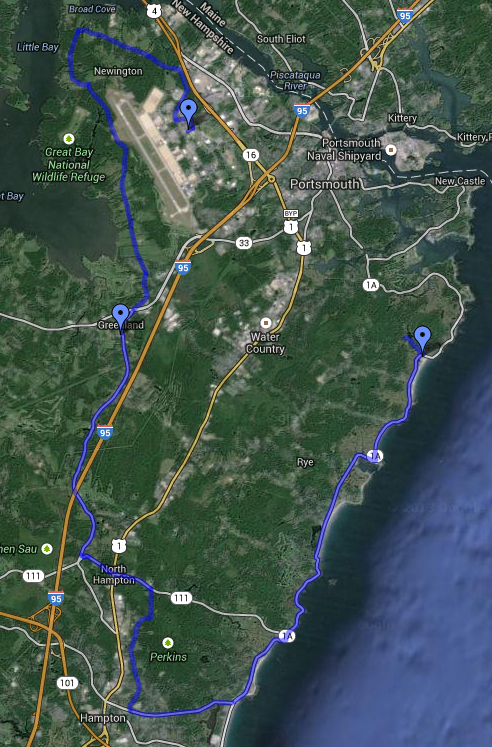 If you’ve ever wanted to see the NH and southern ME coastline, this is the way to do it. Volunteer next year and see what I mean! 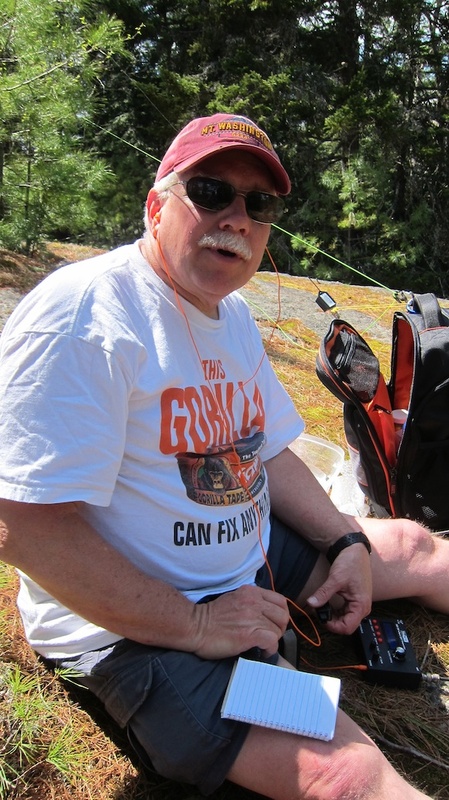 The morning of May 12, 2014 my Morsementor (new word) and good friend Jim Cluett, W1PID, emailed me asking about going out for the day to do low-powered QRP radio. The forecast was excellent. The temperature was going to be close to 80 F and abundant sunshine was in store. After five months of the white death, I needed to see lots of green and blue. Jim suggested we go to the ledges above Sky Pond, a place I’d not yet seen. Apparently there are countless small hidden oases of pleasure hidden on the small mountains of New Hampshire. In several hours I would be introduced to yet another one. It was decided we’d eat lunch along the shore of Sky Pond at the foot of the trailhead. Jim had me copy directions over the phone as he was about 15 minutes ahead of me. When I pulled into the small parking lot adjacent to Sky Pond, Jim was at the shore looking out over the glistening water topped with diamonds courtesy of the sun reflecting off each wave top. “You wore shorts. You’re an animal! I’m a little fearful the black flies will have learned to bite by now and don’t want my legs peppered with welts,” Jim said. “It’s too hot for me for long pants. I guess I could change into my hiking pants with the zip-off legs.” I have three pairs of these synthetic fiber pants and they’re made for cooler mornings and hotter afternoons. They’d stop black fly bites too no doubt. I stuck with my shorts, and would later regret it. Lunch didn’t last long. Before departing up the trail Jim asked if I wanted a squirt of some insect repellent that looked like a thick coffee with cream. “I put it behind my ears. That’s where the flies seem to bother me,” Jim pronounced. I applied some to my ears, arms and should have put more on my legs. Minutes later we started to head up a typical Class VI (6) NH road. These are private roads made for rugged jeeps or beat-up 4×4 pickup trucks. Only an idiot would take their Lexus or nice car up these bumpy rutted roads that have paint-scratching branches reaching out from the edges. It didn’t take but ten or fifteen minutes to get to the cutoff for the short trail to the ledges. 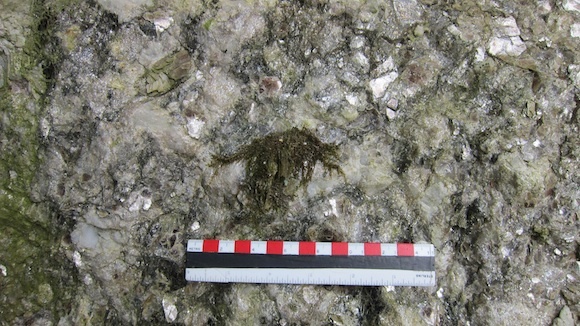 Ledge is the local term used to describe outcroppings of solid bedrock. “I think a better name for it is the Meredith Pyrotechnic Granite.” Jim obviously doesn’t enjoy the finer points of igneous geology. It didn’t take long to get to the end of the very flat spur trail that would deliver us to a stunning vista. 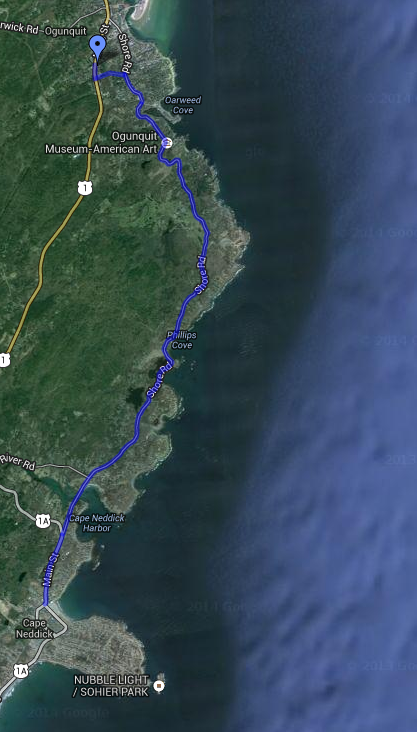 Most of the elevation gain happened on the Class VI roadway. 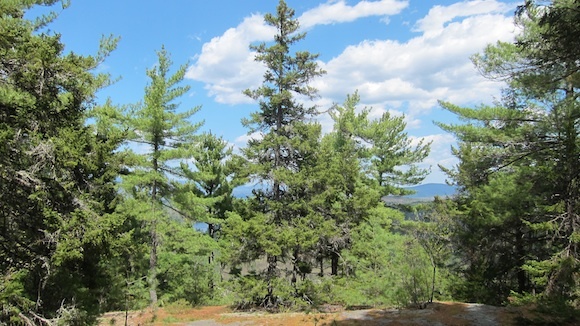 As we crested the trail, I could see ahead peeks of the vista view through the majestic evergreen trees. I walked to the edge of the ledge and looked out at the stunning view. 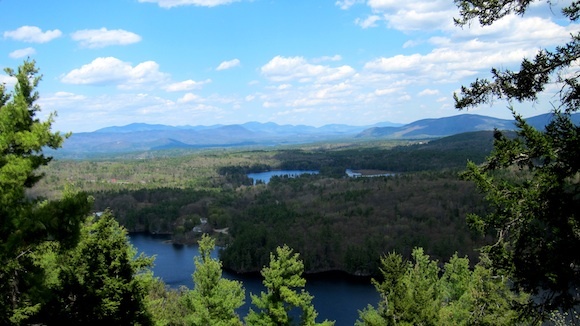 Below us was Lake Winona and off to the left and center were the majestic Squam Mountains. You could also see water in Hawkins Pond beyond Lake Winona. “Do you see the railroad tracks? That’s our line going up to Ashland from the Meredith yard.” Jim was referring to the Hobo Railroad line. I thought to myself that within 30 days of that moment I’d have already completed my second or third day of being a new conductor on the Hobo Railroad. Jim’s been a conductor for several years and suggested I apply for one of these rare positions. I jumped at the opportunity back in late March. “Oh, there they are the other side of Lake Winona.” I made the mistake and was looking out over Lake Winona to the roadway. I should have known better having driven that road and never seeing the track. I had a clear image of the narrow one-lane overpass the tracks use to cross Winona Road about one-half mile from where we were standing. In a few minutes we were unpacking our radio gear and getting antennas up into trees. Jim had his deluxe KX3 Elecraft and I was using my HB-1B radio that was limping along with a bum button that’s used to switch from VFO to Memory mode. I roamed 20 meters hoping to get a quick QSO, but the propagation to Bald Ledge left much to be desired. The band was pretty much dead. I could hear Jim completing QSOs an 15 and 17 meters. When two operators are nearby on the same band, I can hear a dull impulse in my earphones of him sending his call sign and other letters. The best description are ghost signals. I looked but saw nothing. The predator had dipped behind a tree. I’m sure it was a gorgeous sight to see with the winged creature swooping and gliding above Lake Winona. I was having no luck. I could hear strong signals, but when I transmitted I got no response. It appeared I might get skunked. Nothing is worse than an afternoon outdoor radio session that ends with a skunk. I was to find out soon enough two other things could add to this misery. “I think I’m going to stop operating for the day.” Jim usually pounds out about four or five DX QSOs like I’d hammer five 16d sinker nails. “What are you going to do?” I was curious because there was still lots of time and I needed a QSO. “I’m going to goad you.” Ouch! Jim was just kidding, but he decided he was going to come help me get a QSO. Minutes later he was next to me with his backpack. I was sitting in the sun. It wasn’t too hot, but it’s easy to get sunburned early in the spring. I moved, almost tripping and falling over backwards stumbling across a small rise in the granite bedrock ledge. “That was close,” I said. It could have been a serious situation had I fallen and hit my head. Help would not come fast to the ledge and Jim couldn’t pull me back to the vehicles on a lashed limb sled. Not on his best day with me being 40 or more pounds heavier than him. Soon Jim was sitting next to me and was sharing one of my earphones. Minutes later he did a quick QSO with a friend of his in Michigan, Ken, WA8REI. I was nervous and frustrated. What’s more, my little HB-1B transmit speed was set to Jim’s hypersonic send speed. I sent what Jim said to send and Ken responded. I could only catch every fifth character, but Jim was committing the entire QSO to his head. He rarely has to write anything down with his expert CW skills. Minutes later the QSO was over. It was ugly. Ken gave me a 579 signal report and I gave him the same. My dismal sloping antenna was radiating towards the west and it working into Michigan. It was time to pack up. Every now and then I had to move my legs to get the circulation going and to avoid the insects. Soon I was to discover the black flies had feasted on me. We tried to get down my antenna, but it became snagged in the white pine tree. Jim yanked it and got it down, but one of the legs on the choke winder broke. “You can glue this up with a splint and it’ll be fine,” Jim mentioned as we surveyed the damage. The end of the antenna also suffered stripped insulation. Soon we were walking back to Sky Pond. It took maybe 20 minutes at the most to make it back to the vehicles. We ended the outing munching on two ice cream sandwiches sitting on the shady grass at the local gas station. Fortunately Jim helped me avoid being skunked. The outing was a teaching experience to put it mildly. I discovered I still have much work ahead. I need to be able to HEAR an entire QSO at 15, 18 and even 20 WPM. I know I’ll get there, but it’s not going to be overnight. The key is daily practice and I’m not only doing QSOs in my shack, but working with some nice AD5RX Morse Trainer software. Soon I’ll be very respectable on air and able to do QSOs like Jim. You’ll see. Wait until you see a future post of mine this coming August! Two days ago Jim Cluett, W1PID, and I were on top of Steele Hill where Steele Hill Resorts treats its guests to commanding views of the area. We had met with the owner, William Cutillo, finalizing the details concerning the installation of a D-STAR digital repeater up on this very high point in central New Hampshire. It was a stunning blue-sky day. “I’ll see you later,” Jim said as he slid down out of the seat from my beastly Ford F-250 Super Duty 4×4 to walk over to his car. Moments before we had taken my truck up to see where the repeater would be housed. “Okay,” Jim said, although I could sense disappointment in his voice. He knows Knox Mountain well, as I’m certain it’s his favorite place to hike. He knows about black flies and when they learn to bite in the spring, he knows about the finite number of blue-sky days, he knows about cool temperatures, he knows about open forest and he knows when it’s best to go to Knox Mountain. That tiny tidbit of time that would pass after we would hang up was one of those rare afternoons when it’s perfect to go to Knox Mountain, and little did I know I was throwing away the opportunity like you might toss a greasy paper towel into the trash. Fast forward 24 hours and early in the morning via email we made plans to meet at 1 p.m. to drive to the parking area at the Knox Mountain trailhead. “I’m going with Jim this afternoon to do outdoor radio at Knox Mountain,” I mentioned to Kathy, my wife. I pondered that for about two seconds knowing that Lady, our German Shepherd, loves to be outdoors. But a nagging thought surfaced about how on past outings Jim had mentioned to me how wonderful his dog was and how much he missed her. Would Lady throw a wet blanket on the outing? “Jim, would you mind if I brought my dog along on the hike?” I called him about 90 minutes before we were to meet. “Sure. I don’t mind.” I wasn’t convinced. Jim sounded a little distant and his voice lacked his normal overlay of humor. Perhaps it was very insensitive of me to bring along a third wheel, but the words had crept into the cell phone and it was too late to pull them back through the ether. I left the house trying to get to the post office before 1 p.m. I also needed to grab some lunch. As I was walking into the local Subway to grab a sandwich, I noticed I had just missed a call from Jim. Lady and I followed Jim to the trailhead. It didn’t take long as it’s just ten minutes from Jim’s house and up a well-maintained dirt and gravel road. “Hi Lady! 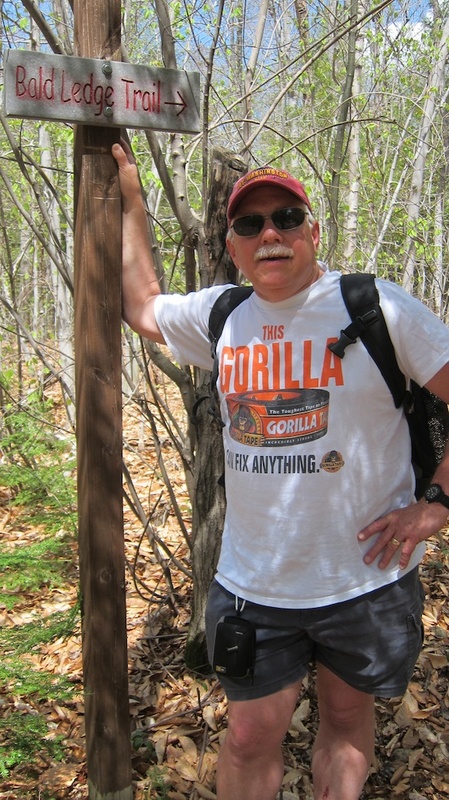 Are you ready for a hike in the woods?” Jim wasn’t faking it. He was happy to see Lady who came over to him pelting his legs with her high-speed wagging tail doing the obligatory sniffing of Jim and taking in all the new smells of the area. We were on the trail in 90 seconds. Soon we crossed the log bridge that at one time was strong enough to support a heavy pickup truck like mine. Time has taken its toll and one of the main support logs has fallen into the stream and the others are spongy. Soon the bridge will collapse. 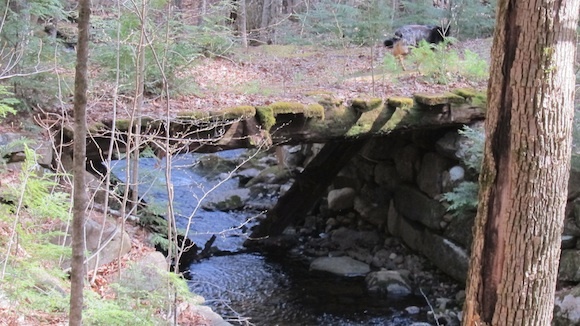 Knox Brook flows under the bridge and it’s like so many mountain streams in central New Hampshire. It’s noisy, it’s clean and it’s tasty eye candy. As we hiked through the woods on the leaf-littered roadway leading to the Knox Mountain cabins and pond, Jim shared stories of past bear and mountain lion encounters. It’s deep woods and thousands of acres of forest connect to where we were walking. No doubt wildlife finds its way here looking for food, companionship or to patrol. 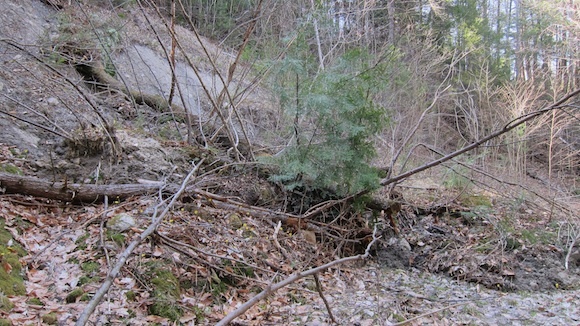 Jim was referring to 100 tons of clay hillside and trees that had slid down towards the stream and was now blocking the roadway. Lady, Jim and I picked our way around the mucky mess and soon we had to cross the brook because a second bridge had succumbed to Mother Nature’s whims. Its rotted logs had been removed a few years back and you now had to cross the brook the way the original settlers did. In just minutes we were at an old concrete dam structure that created the stunning pond. 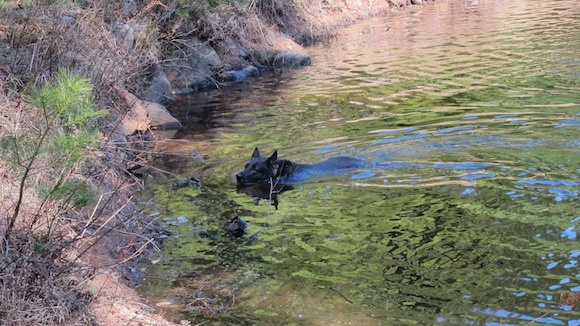 Lady decided it was time to swim as she loves doing so at our home. 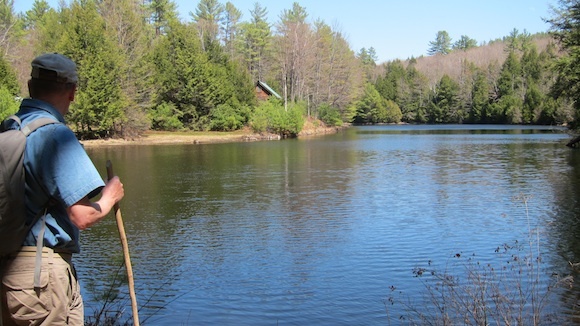 After soaking up the view of the pond, Jim, Lady and I wandered over to the small cabins next to the pond. “Here’s a good tree for you. You have the taller antenna.” Jim was right. Moments later I had my water bottle sailing up and over one of the highest branches. “When I heard that bottle smash into the ground, I thought you had a bum throw. You got a perfect throw the first time,” Jim said as he looked at my green microcord hanging straight down from the tree. When it comes to wire antennas, straight is good. Sloping antennas don’t work as well. Jim took his time setting up on the other side of the cabin because he didn’t want his ghost signals to interfere with me getting my first QSO. Soon we were both on the air and I could hear Jim making contacts. He’s a DX pro and with his skills and with his Extra licensing privileges he’s able to work that part of the 20-meter band where the pros go to make fast QSOs. I avoided getting skunked by working K9MY, Jerald in Antioch, IL. All I got, as he was probably sending at 15 WPM, was his call sign and my RST. He gave me a 559. “I couldn’t get what he was sending because he was too fast,” I lamented to Jim sauntering over to announce I made a successful QSO. “I need to find slower operators,” I added. Jim knows the way. He knows the way to success. Success is me learning to HEAR Morse faster. Success is NOT me trying to find slow operators who peck away on their paddles or keys. It’s up to me to practice and push myself to be able to comprehend Morse code sent at 18, 20 or 25 WPM speed. We munched on some QRP Energy Capsules (peanut M&Ms) and thin potato chips laced with sour cream and onion flavoring. The scenery was feeding our souls, but doing nothing for our bellies. Lady enjoyed some of the potato chips as well. The radio bands were not favorable in central New Hampshire at that point in time, so we decided to pack up and find a store that had an ice cream bar or two. The walk down the brook was delightful and the mid-afternoon sun was bathing the brook with slanted rays of light that produced perfect opportunities for epic photographs. 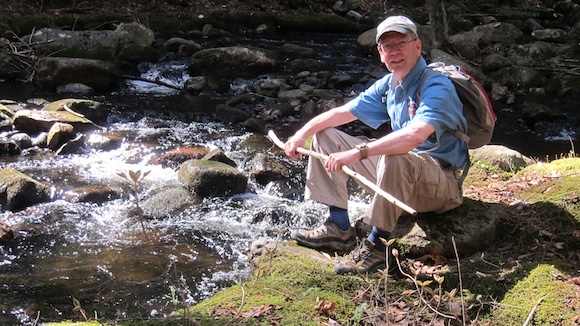 Jim has told me for over a year that this hike, this location and this brook is his favorite place to go. As I walked through the cathedral carved by the brook, I can now see why. If you’re lucky to enjoy what the three of us did, you’ll no doubt have the same opinion of Knox Brook and Mountain.